The story of Confederate raider Shenandoah, which preyed on Yankee shipping in an epic round-the-world voyage. 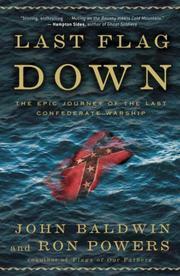 Baldwin, a descendant of the executive officer who left a detailed log of that voyage, teams with Pulitzer Prize winner Powers (Mark Twain, 2005, etc.) to tell the Shenandoah’s story. While their account covers essentially the same territory as Lynn Schooler’s The Last Shot (2005), they focus on Baldwin’s ancestor, Lieutenant Conway Whittle. In London, Whittle boarded Sea King, a steam-and-sail clipper that had set a record for a passage to China, He sailed to the Madeiras, where he met his fellow officers and Captain James Waddell, evidently a deeply troubled, uncommunicative man who distrusted his subordinates. The ship was renamed Shenandoah, provisioned and armed with cannon and commissioned as a Confederate warship. Her mission: to prey on U.S. commerce and weaken the federals’ ability to wage war. Shenandoah’s crew was recruited from captured ships, choosing service with the C.S.A. over being held prisoner. The authors paint Whittle as a romantic hero of the Old South, obsessed with honor and eager to prevent his native land from falling prey to northern aggression. To that end, the raider attacked merchantmen and whalers from the Atlantic to the Bering Sea, where she captured or sank more than three dozen whalers before Waddell was convinced to cease operations by reports that the war was over. Shenandoah then made her final run back to England, dodging U.S. warships and struggling to keep her crew dedicated to a suddenly pointless mission. Whittle, a southern gentleman to the end, declined a chance to escape from his ship as she lay in the Liverpool docks while British officials decided whether to turn her crew over to U.S. authorities aiming to try them for piracy. In the end, the Brits set them all free. A stirring adventure, smoothly recounted.